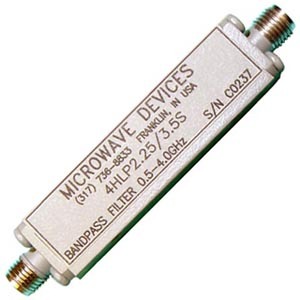 Microwave Devices produces a full line of high 'Q', low-loss combline cavity filters. The combline design provides high performance and is well suited to demanding environmental conditions. Our combline filters cover the frequency range of 0.5 to 18.0 GHz, with bandwidths from 0.1 to 50%. Standard designs are available with 3 to 12 sections, and are equipped with Type N or SMA connectors. Non-contiguous multiplexers are also available. Typical electrical specifications that can be enhanced include insertion loss, VSWR, power handling, and suprious response suppression. Call us regarding non-standard parameters. Combline filters offer system designers extremely low insertion loss in the medium to wide bandwidth ranges. 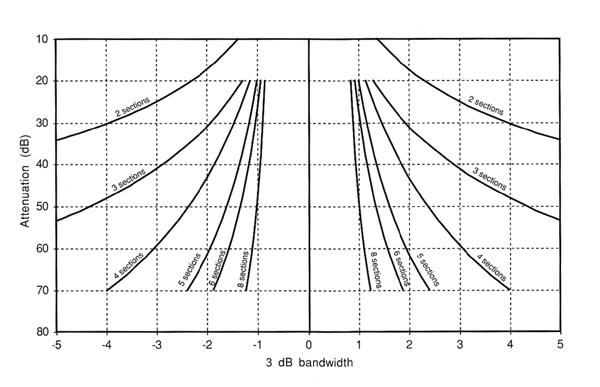 Typical losses are less than 1 dB for most designs with bandwidths greater than 5%. An approximation for insertion loss is 0.1 dB per section. The curves in the graph below are used to estimate stopband attenuation. These curves show attenuation at multiples of the filter's 3 dB bandwidth. While the size of combline filters can be optimized to suit most requirements, the following equation and table can be used to approximate standard lengths ("L"). L = (N) x (Y) +0.4 Where "N" = Number of Sections, and "Y" = Bandwidth (%) value from table. Width and height may be approximated from the following table. Tapped mounting holes, the location and size of which are normally determined at the time of design, are provided on the bottom surface of the filter. Contact the factory for applications requiring non-standard lengths, connector configurations or specific mounting hole patterns.